Bullet Bhats (pun intended) 'coz we just did this last month - 850kms over 2 days riding at riding speeds of 80kmph over some winding roads. My Dad is a wonderful father. Don't blame me if I bring in some of the parenting Chautauqua into this post. It is quite a difficult line to draw, how much to hold on to, and what to let go. He has always had this balance figured out. He let us (me and my sister) make our decisions, to choose what was right for us and stand by those decisions, never once being over scrutinizing or over patronizing us. He let go, so important part of parenting. I look around and find these hyper obsessive parents, forever (and I mean forever) deciding what's good for their children and what is not. The layers and layers of over protectionism seem endless, fuss about this, safe guard from that, firewall this, keep them away from that. "We are incapable of loving another unless we love ourselves, just as we are incapable of teaching our children self-discipline unless we ourselves are self-disciplined. It is actually impossible to forsake our own spiritual development in favor of someone else’s. We cannot forsake self-discipline and at the same time be disciplined in our care for another. We cannot be a source of strength unless we nurture our own strength. I believe that not only do self-love and love of others go hand in hand but that ultimately they are indistinguishable.” ~ Scott Peck"
So, when I asked him if he was up to riding with me to Udupi to attend a cousin's wedding, we deliberated about the timing and if it will cause unnecessary anxiety in the family. And then when I pressed on, he was pillion, that reassuring hand on my shoulder, like so many instances in my life. 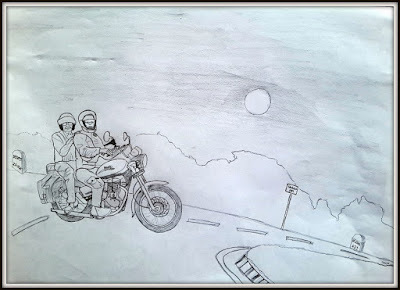 The last time my dad rode pillion on a long ride was on my first long ride to Trichy, way back in 2005. Read this. There was also the betaal (the vampire from Vikram & beetal) that had refused to leave my back. About 2 years back, I rode to Chennai (almost), unknowing to me at that point, with almost no engine oil. What followed was a seizure, towing, over haul of the tappets, rockers, some piston damage and serious dip in my confidence on my bullet. Thanks to some incessant spark plug issue, the beetal didn't leave my back since then. The only way to answer the question - take the leap, ride. I slid in my tool kit with spares into the saddle bag, not wanting to hit into any electrical problem. We started at 6am. And right as we hit the ring road towards the highway, was that a missed beat?? The mist and fog hit us as we headed towards Yediyur. We stopped at Bellur cross for breakfast of idlys and heavy dose of nostalgia. Next stop was while we were on Shiradi ghat, the bridge on the highway which had served as the starting point for the famous Yedikumeri railway trek back in my college days. As we crossed the ghat section, I sighed a relief, now we were in tow-able territory, the betaal was still hovering around. And electrical problems are like on a switch, one moment you are cruising, the next an abrupt stop; dead. We reached Udupi at 1:30, rode straight with jacket & boots to our native village Brahma Vishnu Maheshwara Kaanangi temple. There was a function underway and we helped ourselves to some sumptuous traditional meal. The next morning we attended the Nirmalya Puja at Krishna Mutt - a visual that remains etched in my memory. The wedding done, lunch and some packed food later, we were ready to hit the road once more. We started at 1:30 and were home at 9, with a couple of breaks. And somewhere on the well laid roads from Hassan, riding towards the full moon, in its glory, the reassuring hand on my dad on my shoulder, the beetal seemed to finally get off my back... in the most appropriate way, we put a "bullet" right through it.